Will the internet in Latin America and the Caribbean remain open over the next ten years? Will online surveillance increasingly challenge individual privacy? Will open data, social media and new forms of participation improve democracy in the region? Will we be able to harness the collaborative potential of the internet to create more socially meaningful and sustainable economies? Will digital education, science and creativity flourish in the region, reflecting the diversity and culture of its people? Rather than present a single consolidated perspective, the authors dive into the issues, explore new ways to frame the problems and seek new solutions. Despite the considerable diversity, the book highlights many emerging points of agreement about new opportunities and challenges for the information society in the region. 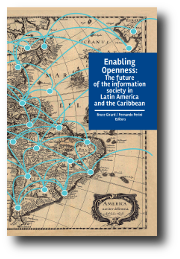 Download or purchase Enabling Openness:The future of the information society in Latin America and the Caribbean. Also available in Spanish as Habiltando la apertura: el futuro de la sociedad de la información en América Latina y el Caribe.